The Boxing Truth®: What’s Next For Andrzej Fonfara And Julio Cesar Chavez Jr.? What’s Next For Andrzej Fonfara And Julio Cesar Chavez Jr.? The Light-Heavyweight fight between former WBC Middleweight world champion Julio Cesar Chavez Jr. and Andrzej Fonfara presented an intriguing storyline. In one corner Julio Cesar Chavez Jr. a fighter who has had struggles in recent times losing his Middleweight world championship to Sergio Martinez in 2012 and engaging in two battles with top contender Brian Vera in 2013 and 2014. The first of those two battles between Chavez and Vera many observers including this one felt that Vera deserved the decision. To his credit however, Chavez left no doubts in his rematch with Vera earning a convincing twelve round unanimous decision. Despite his impressive performance in his second fight with Vera in March of last year, Chavez entered into this fight with Andrzej Fonfara having not fought in over a year. In addition to coming off of a layoff, Chavez was also fighting for the first time in the 175lb. Light-Heavyweight division. Although Chavez fought both of his fights against Brian Vera at catch weights above the 160lb. Middleweight division, it did interest me to see how Chavez would respond to being hit by a natural Light-Heavyweight. Standing in the corner opposing Chavez stood top Light-Heavyweight contender Andrzej Fonfara. Fonfara established himself in the eyes of many as a player in the Light-Heavyweight division by giving a spirited effort in defeat in his challenge of WBC world champion Adonis Stevenson in May of last year. Fonfara rebounded from his loss to Stevenson by scoring a ten round unanimous decision over Doudou Ngumbu in November of last year. The fight between Chavez and Fonfara presented a unique opportunity for both fighters. 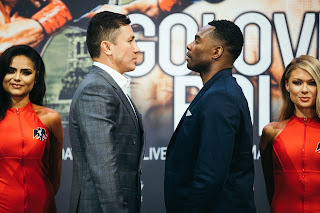 For Chavez this fight represented an opportunity to establish himself as a contender in the Light-Heavyweight division by defeating a recent world title challenger who is ranked in the top ten in all of the sport’s major world sanctioning organizations. For Fonfara this fight was not only an opportunity to continue building momentum toward a potential title shot, but one might argue that a victory over a marquee opponent such as Chavez presented the opportunity to possibly secure a title shot in the near future. An intriguing storyline culminated when Chavez and Fonfara met on April 18th at the StubHub Center in Carson, California. Stylistically, this fight had the ingredients of an exciting battle between two fighters who have shown willingness in the past to go toe to toe with their opposition. What was somewhat surprising from the outset was the disciplined approach in which Andrzej Fonfara executed his offense. Fonfara dictated the pace of this fight from the beginning keeping Chavez at distance and landing combinations. Fonfara’s ability to place his punches well was complimented by a high defensive guard and his ability to use lateral movement to keep Chavez from being able to get on the inside for significant periods of time. As the fight progressed Fonfara continued to dictate how the fight was fought. Fonfara’s combination punching, ability to counter Chavez, and return offense whenever Chavez was able to get close and let his hands go was the story of this fight. Chavez’ defensive flaws were something that Fonfara was able to take full advantage of as Chavez would often lead in with his head and in the process leave openings for Fonfara to execute his offense. Even though Chavez needed to find a way to close the distance between himself and Fonfara and get on the inside of the naturally bigger fighter who also had a three inch reach advantage over him, Chavez’ jab was noticeably absent throughout much of this fight as he often walked forward without throwing punches or using head movement to get on the inside. This resulted in Chavez taking significant punishment before being able to let his hands go. Despite being able to have his moments periodically throughout the fight, it became evident as the rounds went on that Chavez was gradually taking a beating at the hands of Fonfara. Although it was clear as the fight progressed that Fonfara was in control, what was impressive about his performance in my eyes was how he maintained his approach throughout and did not leave Chavez too many openings to attempt to turn the fight in his favor. Even though Fonfara would suffer a point deduction in the seventh round for shoulder butting Chavez, it did not cause him to change his strategy. In the ninth round Fonfara dropped Chavez with a short left hook to the head. Although Chavez would get up from the knockdown, the first of his career, the bout would come to an end at the conclusion of the ninth round as Chavez would ask his corner to stop the fight indicating a possible leg injury. The victory for Fonfara however, would be overshadowed briefly by fans who showed their displeasure of the stoppage by throwing beverages at the ring. Whenever situations such as this arise where debris get thrown in the ring in response to the outcome of the fight, readers have seen this observer periodically reference the scene that followed in the aftermath of John John Molina’s tenth round stoppage of Tony Lopez in their second fight in October 1989. In that fight Molina dominated the action from start to finish and administered a beating to Lopez throughout. The one-sided fight was stopped in round ten causing a near riot from the pro-Lopez crowd in Lopez’ hometown of Sacramento, California at the Arco Arena. A similarity between that fight nearly twenty-six years ago and this fight between Chavez and Fonfara is that like Chavez, Lopez was significantly behind on the official scorecards and was not in a position where he could win the fight by decision. The scene that developed in the aftermath of the stoppage of the second fight between Lopez and Molina remains one of the most ugly this observer has ever seen in the sport. Molina, who won the IBF Jr. Lightweight world championship from Lopez in that fight and his handlers, had to run for cover following the fight being stopped. Dr. Ferdie Pacheco, who was doing commentary on the broadcast of the fight for NBC Sports perhaps put it best when he said that the aftermath of that fight was a disgusting commentary on how far misplaced enthusiasm can go in sports as Lopez was significantly trailing on the scorecards and it was merciful in Pacheco’s opinion that the fight was stopped. The same can easily and perhaps should be said in regard to the fight between Andrzej Fonfara and Julio Cesar Chavez Jr. Although it was clear that the majority of fans who attended the fight between Chavez and Fonfara were supporters of Chavez, the reaction to the stoppage from the crowd in attendance was quite frankly unwarranted and unacceptable. Unlike the scene that emerged in the aftermath of the second Lopez-Molina fight, the scene that followed Andrzej Fonfara’s stoppage of Julio Cesar Chavez Jr. would not be as chaotic as things would quiet down quickly allowing Fonfara to be formally announced as the victor and for both fighters to give post-fight interviews and leave the ring at their own pace. The brief ugly scene that emerged shortly after the fight was stopped however, should not overshadow the performance of Andrzej Fonfara. Fonfara not only confirmed his status as a legitimate Light-Heavyweight contender to those who may not have given him that credit prior to this fight, but he also dominated a fighter who was moving up in weight and who has enjoyed marquee status throughout his career. It will be interesting to see where the twenty-seven year old Fonfara goes coming out of this fight. Fonfara, who called out Adonis Stevenson for a rematch after his victory over Chavez may have to wait for his opportunity for another shot at a world title as Boxing fans and experts alike have been calling for a unification bout between WBC champion Stevenson and undefeated unified WBO/IBF/WBA world champion Sergey Kovalev to determine an undisputed Light-Heavyweight world champion. If a fight between Kovalev and Stevenson can be made in the near future it seems logical that Andrzej Fonfara could face the winner of that fight based not only on his performance against Chavez, but also his status as a top ten contender in the WBC, WBA, IBF, WBO, and IBO Light-Heavyweight ratings. Fonfara certainly deserves a rematch against Stevenson if it can be made and he would also pose an interesting challenge for Sergey Kovalev. We will have to wait and see what the future holds for Andrzej Fonfara, but it is clear his stock continues to rise coming out of this fight. As for Julio Cesar Chavez Jr. it is difficult to tell what he might do coming out of this fight. One should remember that this was Chavez’ first fight in the Light-Heavyweight division and to his credit he chose to face a legitimate contender who recently fought for a world title. Some might say that Chavez could have opted to face someone who was not ranked in the top ten and perhaps someone who is not well known for his first fight as a Light-Heavyweight. Even though Chavez came out of this fight with Andrzej Fonfara on the losing end, he deserves credit for choosing to face one of the best fighters in the division. Although Chavez has lost two of his last four fights and has suffered the first knockout loss of his professional career, this observer does not believe that Chavez is a shot fighter by any means. This fight could be viewed as scenario of a naturally bigger man in Andrzej Fonfara simply besting a fighter in Chavez, who was moving up fifteen pounds above the weight where he was a world champion. In terms of what route Chavez might take next there are a few interesting options. One option might be that Chavez moves down in weight to the 168lb. Super-Middleweight division where he is ranked in the top five by both the WBC and WBA. Although one might assume that the loss to Andrzej Fonfara might affect Chavez’ standing in the Super- Middleweight ratings, despite the fight taking place in a different weight class, perhaps moving down in weight to Super-Middleweight might be viewed as the best option for him. Another option could be that Chavez chooses to continue competing as a Light-Heavyweight and if so he could find himself in position to secure a lucrative fights against some of the best fighters that the division has to offer. Despite losing this fight against Andrzej Fonfara, Chavez does still have a sizable fan following and is still a marquee draw in the sport. Although one might say that the scene that briefly emerged following the stoppage of this fight came from fans who may not have been aware that Chavez himself asked for the fight to be stopped and now knowing that it was he who ultimately stopped the fight that Chavez’ marquee value might be damaged going forward, I respectfully disagree. Julio Cesar Chavez Jr. has now competed in fifty-two professional fights, winning forty-eight of those bouts as well has earning a draw along the way. It is true that Chavez has now suffered two losses in his career, but many great fighters throughout the history of the sport, including Chavez’ father the legendary Julio Cesar Chavez Sr. have at one time or another suffered setbacks and were able to rebound from them and go on to have continued success in their careers. This observer believes the twenty-nine year old Chavez needs time to regroup and if he can bounce back from this defeat, his loss to Andrzej Fonfara may ultimately be viewed as a bump in the road of what could be viewed as a great career when all is said and done.